Jacquard Basic Dyes are bright, beautiful and easy-to-use. The perfect colors for hard-to-dye substrates. Developed for acrylic, these dyes are also great on wood, reeds, straw, paper, leather and hemp! Use them for potpourri, wigs, buttons…the list is endless. 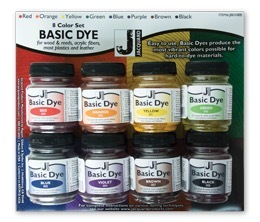 This eight color set includes 0.5 oz jars of: yellow, orange, red, purple, blue, green, brown, and black.